The parent company of the New York Stock Exchange is to be sold to smaller rival Intercontinental Exchange (ICE) for $8bn (£5bn). Atlanta-based ICE is offering cash and shares for NYSE Euronext, although the deal will need regulatory approval. ICE said that it planned to float off the Euronext part of the business, which runs the main stock exchanges in Paris, Brussels, Amsterdam and Lisbon. 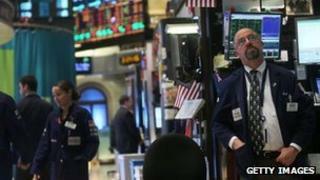 Shares in NYSE Euronext rose 32% following the announcement. However, ICE's share price fell 4%. ICE is offering $33.12 per NYSE Euronext share in stock and cash, which is a 37% premium on NYSE Euronext's Wednesday closing price. If the deal gets the backing of regulators, the combined company would become the world's third-largest exchange group. Last year, the US Justice Department blocked an £11bn joint hostile bid for NYSE Euronext by ICE and Nasdaq OMX, which owns the Nasdaq stock market. This time around, ICE has bid on its own, and got the backing of the board at NYSE Euronext. ICE is an internet-based operation that allows the trading of a number of commodities, such as sugar and cotton, as well as financial products. Its chairman and chief executive Jeffrey Sprecher said: "We believe the combined company will be better positioned to compete and serve customers across a broad range of asset classes by uniting our global brands, expertise and infrastructure." A separate bid for NYSE Euronext by Deutsche Boerse, the company that runs Germany's main stock exchange, was blocked earlier this year by European regulators.